And one thing this chart does not take into account is the fact they commit a disproportionately larger amount of violent crime, therefore would be in a position to be shot by a cop much more often. So I wonder what what deep psychological and genetic scars we European descendents have from the depredations of the North Africans and the Middle Eastern slavers? They enslaved many of European descent. Well if you have 800 pieces of regular crayon, and only about 88 pieces of 'other' crayon. If 60 of the regular pieces get shot, and 30 of the 'other' pieces get shot, which is more likely to get shot? I like talking to people like you though. So now you're comparing people to crayons AND not only that, but you're insinuating that the crayons representing American of color are crayons other than "regular?" WOW! Those who live in glass houses, man. It's hard to talk with people like you because you believe in myths. Facts are not found in your claims. Black men are RARELY killed by cops. 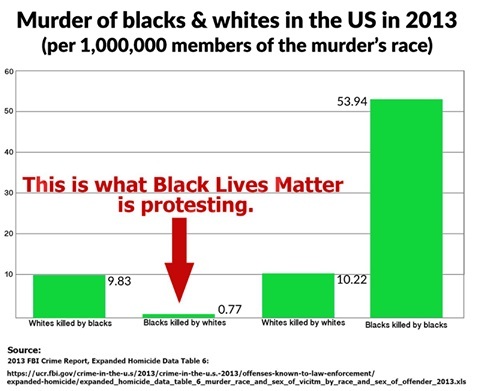 White people are killed more by cops and you actually have a batter chance of being shot by a cop if you're white. Also, black men )6% of the population) commit more than half of the violent crime in this country. These are facts you ignore in place of racial paranoia and scapegoating of whites. What's that make you? If you read this because the title bothered you, you should look into yourself. If you're planning to respond in a bothered tone, look at yourself a bit..
would you be kind enough to provide a source for this graphic? Why did you just post the graph and leave out all of the important stuff that explains the higher number? More than 21% of deadly incidents began with a complaint to police alleging domestic violence or some other domestic disturbance. About 16% arose from officers attempting to arrest a wanted person, execute a warrant or apprehend a fugitive. Another 14% of killings followed an attempted traffic or street stop, 13% came after someone committed a violent crime and 7% after a non-violent crime. In addition to those killed after opening fire, 160 people were accused of refusing commands to drop a weapon. Another 157 were said to have pointed or levelled a gun or non-lethal gun at officers. Police alleged that 158 people killed had “charged”, advanced at or fought with officers. And while 79 people were killed after allegedly “reaching for their waistband” or grabbing for a weapon, 44 attacked officers, some with knives and blades. “It would appear that police officers are often confronting people who are armed, non-compliant and threatening,” said David Klinger an associate professor of criminology at the University of Missouri-St Louis. it really is fascinating what you find when you have an article to read and not just a graphic presenting information outside of context. I'm more progressive than most on this site. The one recommendation I would make is not to stereotype white people either. If it's wrong to do that to black people then it's bad to do that to whites. This doesn't mean that some of your other points don't have validity. .